UPPER WEST SIDE — In four years, an Upper West Side middle school with underperforming teachers and a mediocre attendance rate has become so desirable among district parents that it now has a waiting list, according to the administration. 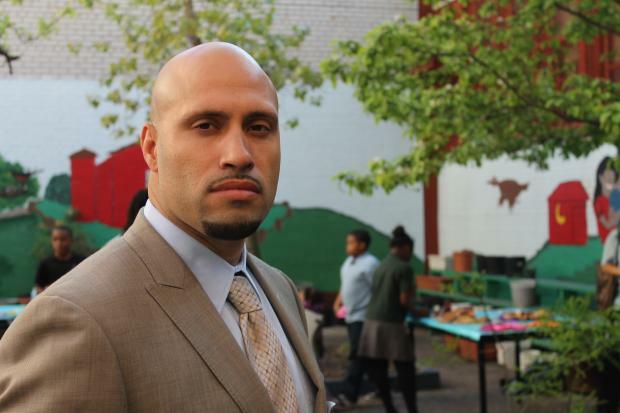 Formed in 2009 as a replacement for Middle School 44, which was considered failing and closed by the DOE, West Prep Academy had an admittedly rocky start, said Principal Roberto Padilla, who was brought on in February 2011 to help turn the school around after his success in changing the Bronx Middle School 31. There was an at-risk population of 110 that "didn't feel wanted in the school [building]" it shared with three other schools on West 77th Street, and that "didn't get along with the adults" in charge, Padilla said. There were no musical instruments available, and little gym time. "Students rebelled, but they wanted to be loved. They wanted people to say 'We demand something from you,'" he said. Dr. Susannah Jacobi said her daughter Elinore, who entered in the school's second year, would come home with horror stories of a trash can lit on fire in the math classroom and teachers who were taunted. "The school seemed to be out of control. There were fights in school. The test scores were really awful," Jacobi said. The school's reputation put off parents like Terri Watson, who, after two appeals to the DOE for her daughter Tyler to attend another school, became resigned to Tyler beginning at West Prep in the fall of 2010. "It was very laid back. There wasn’t a lot of structure. There wasn’t a lot of space and opportunities to mature as a middle school student would," said Watson, who also described the school as "pretty lawless" and "not challenging" academically. "The teachers may have been prepared, " she said. "Just not for that school." In February of that year, the DOE dismissed Principal Emily Noto, said Jacobi, who described her as "friendly and collegial," but said, "there was something about her that wasn’t a leader." Padilla was seen as a possible solution to what was becoming a disastrous environment for students. At the end of that school year, Padilla said he replaced all but one of the eight teachers serving the 110 students. Some left on their own when they heard about his style and goal of completely shifting the culture and expectations at the school. Several were fired for underperforming. With the chance to recruit all new teachers, Padilla said he hired 18 "rock stars." His new team had "a moral imperative to close the achievement gap," he said. A growing local elementary school population forced it to move in the fall of 2011 to its current location on West 105th Street between Amsterdam and Columbus avenues, where it has grown to more than 200 students, Jacobi said. The new team, coupled with a new building, helped West Prep move its attendance rate from 84 percent when he started to 94 percent by the end of 2012, he said. By creating structures like "the super scholars," a club for anyone achieving higher than an 85 percent in their classes, Padilla began to change attitudes towards academics. "There was very little discussion around getting good grades [when I first came]...now the kids who are getting good grades are the popular kids," he said. Strict discipline cut down on fights and energized, engaged teachers created a new atmosphere, he said. Watson said these changes didn't happen overnight, but that Padilla "held steady and stayed behind that wheel and really transitioned the school and the thinking." The principal said he hadn't yet received this year's state test results, but that "the number of students who are passing is much higher." Padilla, who just received his PhD in turnaround school leadership from Fordham University, didn't change the school alone, Jacobi said. He partnered with as many organizations as he could, including VH1's Save the Music, Parsons School for Design, Columbia University and others. One of the initial issues was that West Prep was founded with a magnet grant of $1 million over three years, but the first administration wasn't doing anything with the funding, Padilla said. By buying state-of-the-art media-making technology and training teachers on how to use and teach it, Padilla said the school now has a clear mission — "Youth Voices through Youth Media" — and has built a sustainable program that will live beyond the life of the grant. This year, a group of students traveled to the Dominican Republic to work on a documentary about baseball camps there. In 2014, the school has its sights set on a trip to China for another media project. The school has changed dramatically, said Watson, who said she was proud of the 23-student waiting list. "A waiting list says something. It speaks volumes, [like] something great must be going on there," she said. Jacobi said she wasn't surprised at all. The school sends its Super Scholars to talk about West Prep at local elementary schools, middle school fairs and has them lead tours — all powerful marketing, Jacobi said. "It is becoming a remarkable school," she said.